The Rise Against the Empire Play Set will be available for wide release on August 30,2015. Be among the first to the own the galaxy's most notorious bounty hunter! Disney Infinity 3.0 Edition now welcomes Star Wars™ to the ever-growing collection of Marvel, Disney and Disney Pixar characters, stories and worlds. Together new heroes can join forces with characters from previous editions and embark on adventures as big as your imagination in the 3.0 Toy Box! Disney Infinity encourages you to play your way, whether you explore open-world creation in the Toy Box or story-driven gameplay inside Play Sets! Venture into the 3.0 Toy Box, where you can create your own universe and mix, match and mash up all Disney Infinity characters in one place. You can also jump into Play Sets where you can play inside the worlds of your favorite characters and relive distinct experiences, varied gameplay, environments and characters. One Game. Two Ways to Play. Play Sets allow you to play inside the worlds of your favorite Disney Infinity characters and offer distinct experiences, with varied gameplay, environments and characters. Unlock new adventures from all-new Disney Infinity 3.0 Edition Play Sets featuring Star Wars™, Marvel, Disney and Disney•Pixar. Enter the new Toy Box 3.0, a wide-open world of possibilities where you create your own stories, worlds or games with all of your favorite Disney Infinity characters! Mix, match and mash-up Disney, Disney•Pixar, Marvel and Star Wars™ characters together in one place! Evil forces scheme for world conquest as they pit allies against each other! It’s an all out brawl in Marvel Battlegrounds! Engage in the ultimate rumble as Marvel Super Heroes and Villains struggle to gain control of Wakanda’s most valuable resource, Vibranium. Leap, charge and dash into 12 levels across 8 all-new battleground arenas and smash through floors, walls, and tear down the environment as you battle to defeat your opponents. Super Heroes and Villains of all sizes can instantly turn the tide of battle by using their special powers and their unique attributes like “Hulk’s Raging Roar” to overpower up to 3 other opponents. Select Super Heroes and Villains from your ENTIRE collection of Marvel characters in Disney Infinity and enhance your game with up to 6 Round Marvel Power Discs at a time! 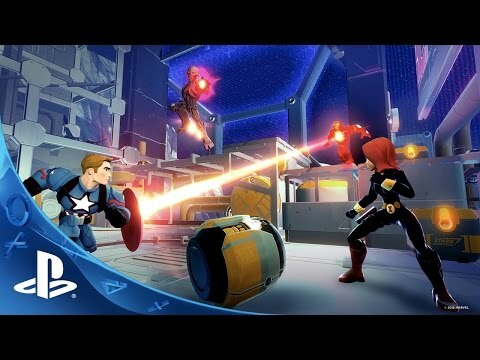 Use Captain America’s shield to attack from a distance and increase the power of close quarters combat. Shrinks to the size of an ant, but increases in strength to pack a powerful punch. Web slinging, wall-climbing Spidey power. Wakanda’s leader fights alongside the Avengers using acrobatic skills and Vibranium claws. Disney Infinity 3.0 Edition now welcomes Star Wars™ to the ever-growing collection of MARVEL, Disney and Disney•Pixar characters, stories and worlds. Together new heroes can join forces with characters from previous editions and embark on adventures as big as your imagination in the 3.0 Toy Box! Disney Infinity encourages you to play your way, whether you explore open-world creation in the Toy Box or story-driven gameplay inside Play Sets! Venture into the 3.0 Toy Box, where you can create your own universe and mix, match and mash up Star Wars™, MARVEL and Disney characters in one place. You can also jump into Play Sets where you can play inside the worlds of some of your favorite characters with true-to-property experience, varied gameplay, environments and characters. In Star Wars™: The Force Awakens Play Set, players will travel to a galaxy far, far away alongside new heroes and old friends in search for a much-needed ally. Playable characters include Finn, a soldier on a path to adventure and danger, and Rey, a true survivor who is resourceful and capable. Both will join Poe Dameron, the trusted pilot of the Resistance who uses his expert flying skills to travel the galaxy, and Kylo Ren, an enforcer for the First Order who terrorizes the galaxy with devious acts.